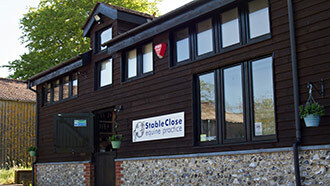 Stable Close Equine Practice is a 100% horse practice providing high-quality equine veterinary care in Hampshire. We have a team of four experienced equine vets who focus on a wide range of disciplines from equine sports medicine and lameness to breeding and preventative medicine. We have clients as diverse as racing yards, top level dressage riders, riding schools and family ponies. We have high-quality, mobile digital x-ray systems as well as ultrasound and other diagnostic equipment. We have invested heavily in equipment which allows us to treat your horse at your yard whenever possible. Our practice provides high-quality equine veterinary care in Hampshire with a team of four full-time equine vets. This section has more information about the services we offer such as radiology, ultrasound and stud work. We have useful information sheets on a wide range of equine veterinary matters such as colic, strangles and sarcoids. They can also be downloaded as printable PDF files. Information for all clients about the nature and scope of our services including our terms of business and practice area.